WOW! I made this one for breakfast this morning and knew after the first taste that it was definitely one to share. I used dried pineapple rings because of the time of year, but if you have fresh available go for it. 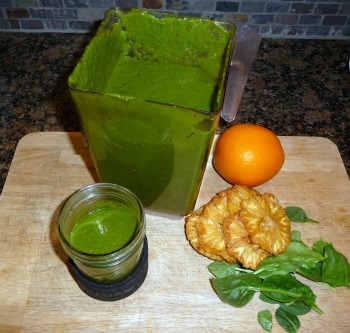 Add all ingredients to your blender including the soak water and blend. When I make my smoothies I always see what I have in the fridge or on the counter that needs to be used and could go into the smoothie. Whether it’s fruit, veggies, or herbs they always add some nutritional value, but you don’t always taste them depending on how much of what went in. With this smoothie I had the fennel stalks left over after using the bulb for another recipe and did get a hint of the fennel coming through in the smoothie.